Health and travel. Could there be any more mutually exclusive pursuits? It’s like saying you want to pray to Bachhus and Panacea at the same time, you want to live in the moment and plan for the life to come, to seize the day and also create your best self, the one who’s gonna live until she’s 107. Local Flow? More like local finally. 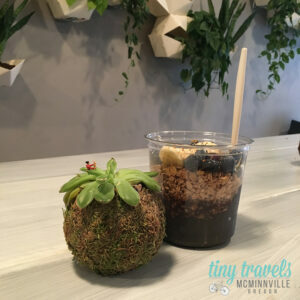 Health-conscious townies cheered when this health bar opened in late 2016 with its mix of smoothies, acai bowls, fresh juices and lunch bowls. Its concept places your feelings at the forefront – how will you feel after you eat this food? If my experience is any indication, the answer is: Pretty darn peppy. If you don’t want to drink breakfast, try the Green Machine acai bowl, which layers whole blueberries, bananas, granola, honey, bee pollen and chia seeds atop a thick smoothie of acai, granny smith apple, kale, spirulina, spinach and coconut water. I don’t know about you, but when I need headspace, spending time with strangers in an empty room usually does the trick. Drop-in yoga is easy for travelers at Four Elements, an attractively unpretentious studio and yoga shop on 4th Street. Expert teachers lead classes in beginning yoga, vinyasa flow, gentle yoga, pilates, shoulder & back care and other specialized form. Added perks? The yoga community here attracts everyone and their grandmother to a space designed to limit distraction. Pop in for inspired lunch at Valley Commissary, where Chef Jesse Kinchloe and his team take farm-fresh ingredients and puts them through the most compelling creative gauntlet in town. It’s upscale but not overkill, visually inspiring without being too pretty to eat, and the focus on fresh ingredients means there are choices enough for the health-conscious. Kinchloe doesn’t focus on healthy eating, per se. His interest is more in finding fabulous flavors – just check out the rotating selection of salads for an indication: Delicata squash with local greens, feta, and pumpkin seeds, and raddichio dotted with calabrain vinaigrette might be the answer to the eternal question: Live for now or for later? Get moving at Miller Woods Conservation Area, 130 acres of forest and grassland just five miles west of McMinnville. The property, gifted in 2004 to the Yamhill Soil & Water Conservation District, is a Who’s Who (or maybe a What’s What) of Oregon ecosystems, including hayfield and oak savannah, established and newer timber stands, reflective ponds, and fauna-rich streams. Download a trail map here and pick your pleasure – a quick trip around the education loop or a deeper foray into the forest. Tucked underground on the corner of Davis and 3rd Street, Velvet Monkey is the place to go for a moment of respite and some major overhaul from the inside out. Proprietor Salem Sharfeddin keeps a wide selection of medicinal and herbal teas to support health. Drinking tea for health has short-term rewards – warm hands, lifted spirits – but it’s also a pursuit for those in it for the long game. Try the “Cleanse,” an Ayurvedic blend of green tea, orange peel, cinnamon, ginger, senna, fennel, cacao and pomegranate, or pick up some liver-cleansing Dandelion Root or a “Detox Tea” of burdock, dandelion, peppermint, red clover, licorice, yellowdock and ginger. Check the calendar listings for the tea room’s Thursday night, soul-cleansing poetry readings. With 25 restaurants on 3rd Street, healthy options abound. Local health nuts – especially those who are on elimination diets – love Pura Vida Cocina for its inventive Latin American fare, fun atmosphere and focus on clean, local ingredients. Discover small plates that satisfy here – tacos to order, on handmade corn tortillas are a favorite – as well as heartier meals like Chille Relleno and Enchiladas de Mole. Meeting needs of the local gluten-free community is high on the proprietors’ mission, so look for quinoa-stuffed piquillo peppers, taquitos with smoked trout, and braised pork empanadas in a crispy corn casing to please your gluten-free soul. If you find yourself lingering in McMinnville, don’t despair about your dark-sky options. Go for a kombucha on tap at The Bitter Monk or hit up The Growler Station on the way out of town and toast to your health!